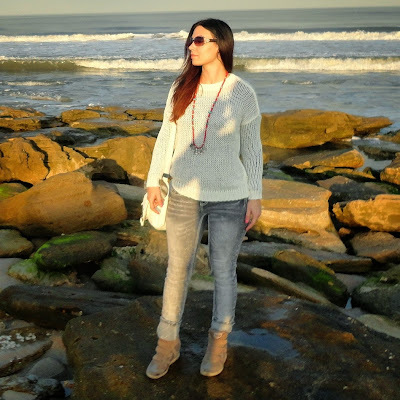 Outfit Ideas: December in Florida - Leila D.
Spent a wonderful and relaxing day at the beach in this comfortable and trendy outfit. The weather was beautiful, not warm enough for swimming but perfect for taking a walk and enjoying the beauty that Florida has to offer. One of my favorite jeans at the moment are these awesome Ariya jeans which I bought at JCPenney. The lovely casual sweater is from Marshalls, the very comfortable sneakers in which I could walk the whole day long are from Skechers. The stylish necklace is Steve Madden and my chic sunglasses are Gucci.